Torrefied wood or biocoal is generally regarded as a bioenergy carrier for co-firing with coal in large scale power plants, nevertheless, some of its properties may make it suitable also for use in small-scale applications. A group of Finnish researchers at the Lappeenranta University of Technology has investigated the combustion behaviour and the emissions of torrefied wood pellets in small-scale biomass boilers, and has demonstrated that biocoal can be used in this kind of appliances. Biocoal is the product obtained from the process of biomass torrefaction: a heating treatment at temperatures in the range of 240 – 300 °C, in which the wood structure changes and becomes more similar to coal. Biocoal pellet has a higher calorific value, lower moisture content and higher hydrophobic properties than wood pellet, which makes it more stable and durable during transportation and storage in open air. Emissions from combustion of torrefied pellet and wood pellet in a 20 kW biomass boiler. Source Foehr J. et al, 2016. 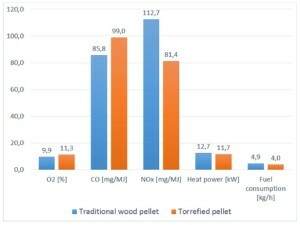 The study analysed the properties of combustion gases of torrefied pellets and compared them with those of traditional wood pellets. The torrefied pellets were produced in the Torrec pilot plant located in Mikkeli, Finland, using birch woodchips, which were first torrefied, then crushed and finally pellettized, without using any binding agents. 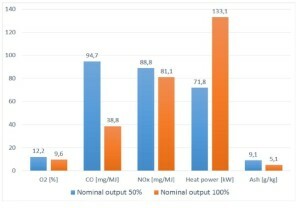 The tests were carried out on two pellet boilers (20 KW and 120KW nominal output), the smaller one was used to compare the combustion behaviour and the emissions of both feedstock, while the larger one was fed only with biocoal pellets, and was used to analyse the change in emissions when burning at different nominal power outputs. A flue gas analyser connected to the gas pipes measured the emissions in terms of CO and NOx. Fuel consumption and ashes production were also measured. 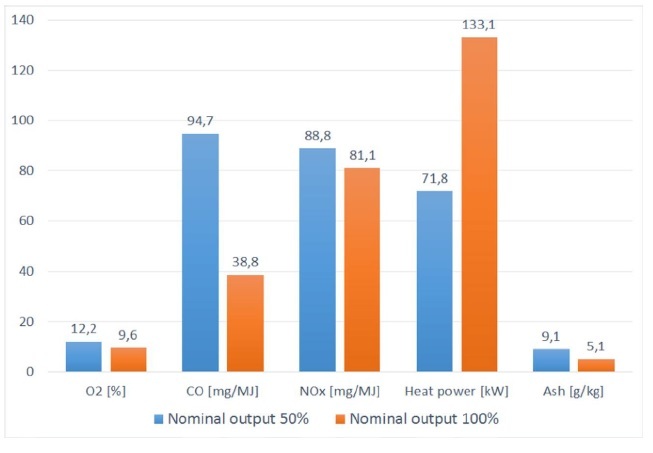 Results of the tests in the 20-kW boiler showed that the consumption of biocoal was lower than wood pellets (4.0 kg/h versus 4.9 kg/h), despite the biocoal showed a slightly lower heating power (11.7 kW versus 12.7 kW). In these tests biocoal showed slightly higher CO emission ( 99 Vs 85 mg/MJ) and much lower NOx emissions than wood pellets (81 Vs 112 mg/MJ). The high CO emissions indicated an irregular combustion, most probably due to the small size of the combustion chamber for the size of the biocoal pellets (8 mm). However, when biocoal was burned in the larger boiler at higher nominal outputs, both CO and NOx emissions decreased significantly. The study demonstrated that biocoal pellet from biomass torrefaction can be used in small-scale boilers with good performances. This could represent an interesting opportunity for all biocoal producers to develop their business in a different market segment than the traditional market for co-firing, which is often hampered by the fluctuations in the global prices of coal and emission allowances. 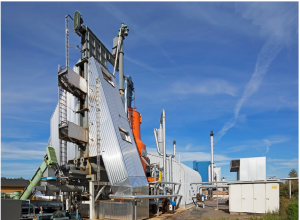 This post is based on the paper “Energy production by Biocoal Pellets in boiler of small scale” J. Föhr, J-P. Lemponen, H. Soininen, T. Ranta, presented at the 24th European Biomass and Conference Exhibition.